High quality spotting scope and state-of-the-art digital camera in one full-featured, easy-to-use unit. Introducing the VistaPix Imaging Spotter (IS70) from Celestron. Capture the action closer than ever before with this 3MP digital camera spotting scope. Unique product, advanced features, unbeatable price. 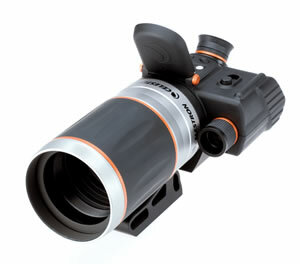 The VistaPix IS70 features a 70mm spotting scope with 14x magnification. The 3 megapixel camera features a 2" LCD screen for a sharp, clear imaging preview; 6x digital zoom; a digital focus meter for quick, sharp focus; dual power for high magnification or wide field of view; and continuous video capability. And with its great close focus, the IS70 can capture amazing detail -- perfect for getting up close with a variety of nature's treasures both great and small. Other IS70 features include a rotatable tripod adapter that fits standard photo tripods or Celestron computerized mounts and the ability to view images on your TV screen with the included video cable. The IS70 also includes a protective carrying case for travel and storage. All VistaPix IS70 models feature Celestron?ear warranty.